How many times have you been to the beach or taken your kids to a sand box and seen forgotten beach toys littering the place? These toys can be so much fun for children (and adults), but often end up forgotten on the beach, trashed when outgrown or broken from over use and then trashed. 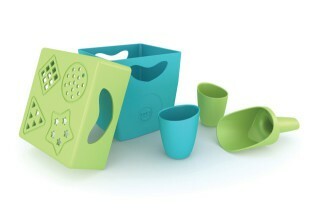 Zoë b biodegradable beach toys leave behind less plastic waste. Zoë b biodegradable beach toys is a unique five-piece set made with Mirel bio-plastic material containing corn sugar from American-grown corn. In 2-3 years the toys begin to biodegrade when they are immersed in soil or water. They will also biodegrade in home composts or when composted in industrial facilities. "Ordinary plastic takes up to 500 years to degrade, and even then it only breaks down into tiny particles that are toxic to wildlife and the environment" (http://ecologicalbabies.blogspot.com). However, these eco-friendly toys will not biodegrade in landfills, as most biodegrading products do not.